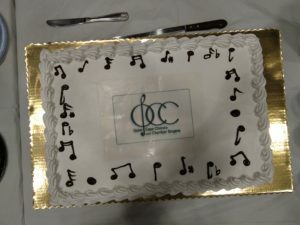 May 2019 – Opera meets Broadway! There were a couple of changes to the room this week: A long, mystery table with desserts sat between the S2 and T1/B1 seating, and there were town names posted on the wall. Desserts … cake?! But let’s do this in chronological order. First there were people signing in, getting settled, and catching up. Discussions ran from the music to home renovations to anything imaginable in between. Then there was the excitement of seeing even more people at this rehearsal. I’m guessing we are now at full strength. More chairs! We started with our normal warm-ups, and as usual, Allison worked out ways to add exercises to get us ready for the various things we would need to do in the music. One addition today was octave jumps. Right after warm-ups, we worked through sections of our music that had these intervals, later combining them with surrounding sections. It was a very productive first hour. Let them eat cake … while they meet and greet with their neighbors. The tables were set up to serve desserts for our meet-and-greet. While eating cake and standing near your town name, you could meet others that you might not have known were your neighbors. (Sadly, it wasn’t until everything was explained that I would have the horrifying realization that singing T2 meant I had an insurmountable logistical problem in getting to the cake quickly. It was a traumatic moment, but afterwards someone who was raised in a large family took me under her wing and explained table calculus to me, making sure I would be well prepared for next time. A kind lady.) The meet-and-greet was a lot of fun. I met five people that I had no idea live in town with me, and I think others had similar experiences. This was a great way to break the pattern of just talking to the people who sit around you. 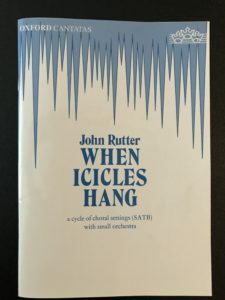 Finally, it was back to singing, working the tricky rhythms and chords in “When Icicles Hang” and “Winter Wonderland of Snow.” It’s a great feeling when you hear complex measures click into place, because you can start to imagine what it will sound like once we truly know the pieces. This week was step 3 of 14. It’s looking like another wonderful concert is on the way. Signup and receive emails announcing upcoming events, news, and more!